I hate to say this, and I never thought I would be saying this, and I’ll probably cop some flack for this post, but I wouldn’t hurry back to Esperance. And that comes just as much of a surprise to me as it might to you. Esperance had been high on our Aussie bucket list for so long. Everyone kept saying, “You just have to go there. 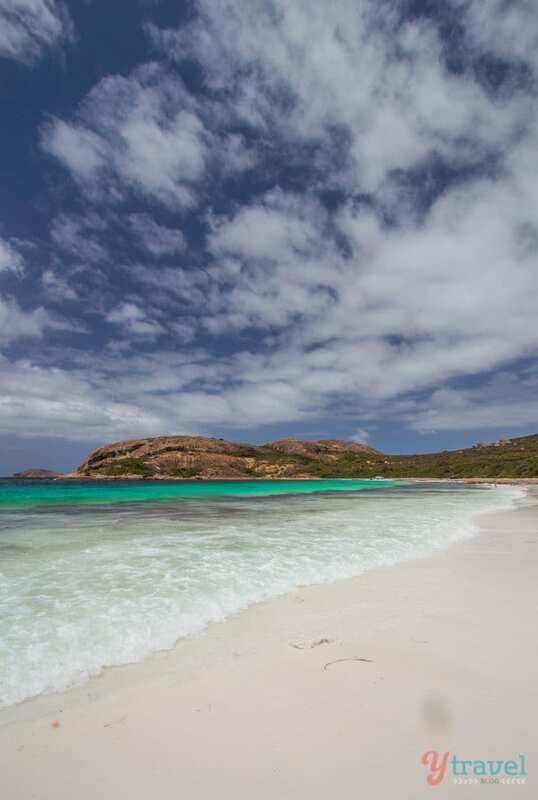 Wait until you see the beaches around Esperance, you’ll be blown away!”. Maybe that was part of the problem. Our expectations were so high, as we’d already been BLOWN AWAY so many times since we’d started our trip. It was getting harder and harder to be blown away by places, especially by beaches. In defense of Esperance, it was up against me from the minute I arrived in town. Mentally I just wasn’t in the right frame of mind. I’d become jaded from 16 months on the road around Australia. Our trip had started to get to me and I wasn’t that excited about seeing yet ANOTHER beach. After traveling for so long travel had become the norm, and once things become the norm, they become less exciting! 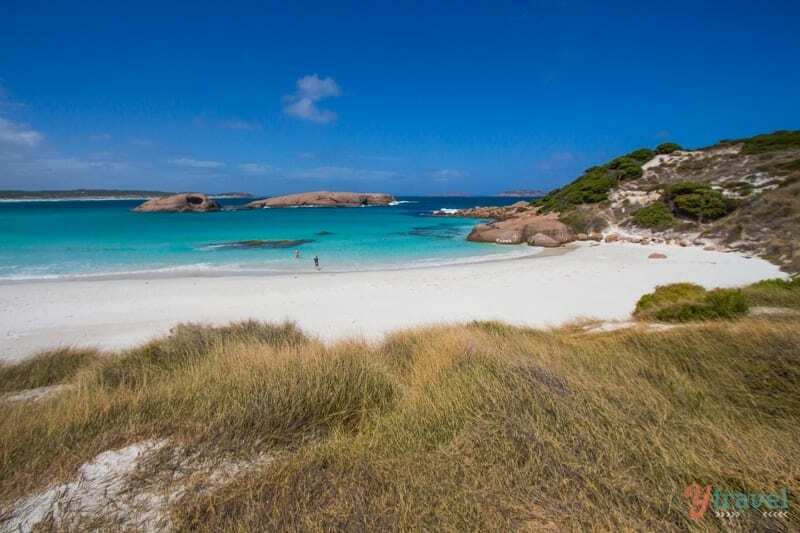 For those that don’t know, Esperance is the gateway to Cape Le Grand National Park, home to Lucky Bay. 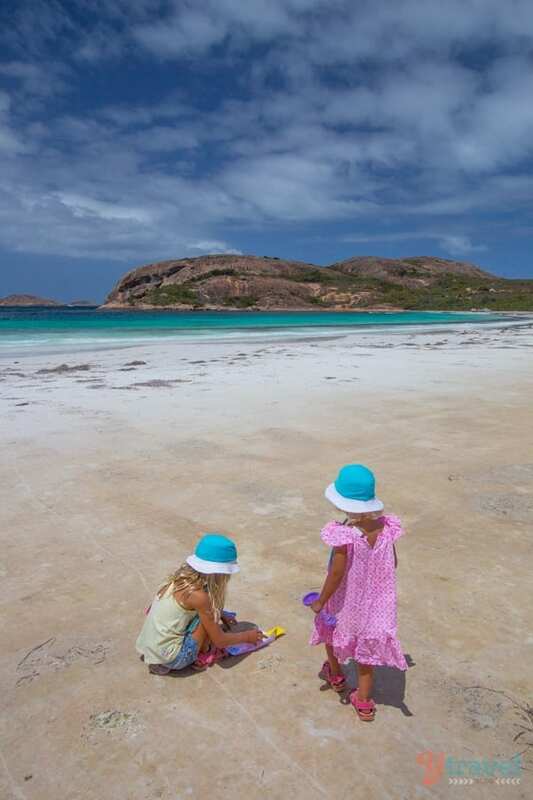 You’ve probably seen photos of Lucky Bay, that famous beach with kangaroos hopping about. It’s been used extensively in promo material forever. And when I say gateway, it’s still a one hour drive east of Esperance to Lucky Bay. In my mind, I had already seen 38 of the best beaches in Australia. And that list doesn’t yet include my 9 favourite beaches of Margaret River, which to me are some of the best in the country! We are spoilt for choice when it comes to beaches in Oz, a quality problem, and at that stage of our trip I would have been content to call it a day on beaches. As for the town of Esperance, it just didn’t do anything for me. I found it a bit rundown, drab and lacking any real vibe. I remember saying to Caz as we did a few laps after first arriving trying to get a feel for the place, “McDonalds is the most modern building in town, what’s that saying?”. Turns out, first impressions count. And arriving from Margaret River, Dunsborough and Fremantle, I was always going to judge the cafe scene, of which there was little. 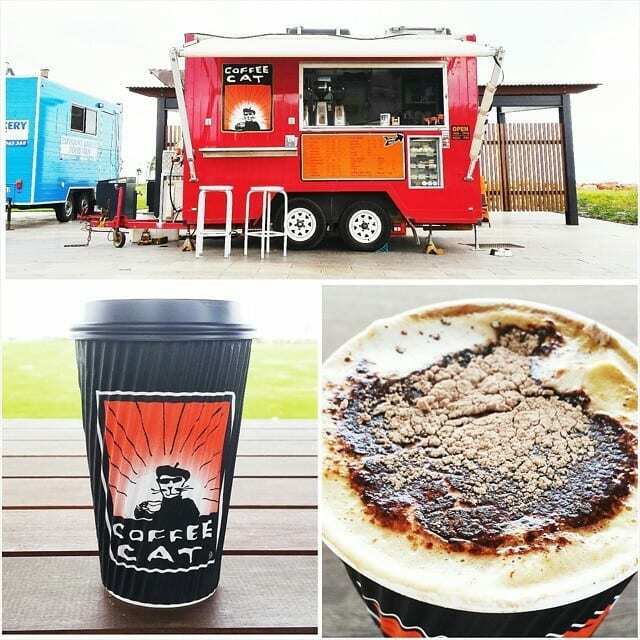 Although I will give a shout out to Coffee Cat, a cute mobile coffee truck on the Esplanade. Delicious coffee at cheap prices! I hate to be so critical, but besides the surrounding beaches it just lacked as a family travel destination. I mean, somebody had decided to build a full-size replica of Stonehenge. Number 5 on the list of things to on TripAdvisor. It just seemed a bit weird. What is the connection? And when I hear of people saying the real thing is a bit of a letdown, why would I want to see a replica? 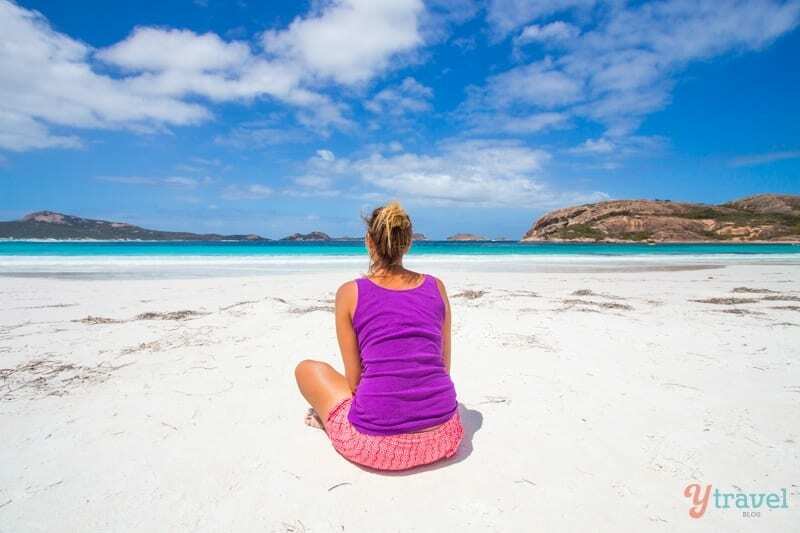 At an eight hour drive from Perth, Esperance is isolated. And in case you didn’t know, Perth is one of the most isolated cities in the world. That’s extreme isolation. Now that might appeal to you, but for me it was a lot of effort when I just wasn’t up for it. If you’re passing near to the area like we were on the way across the Nullabor, then it’s worth a stop. If you haven’t seen many beautiful beaches in Australia yet, then it’s definitely worth checking out. But, since we’d been so hyped up about them being out of this world, we were disappointed to not get that expectation. We still think Western Australia has the best beaches in the country, although Whitehaven Beach in Queensland is still my number one, with Cable Beach in Broome a close second. 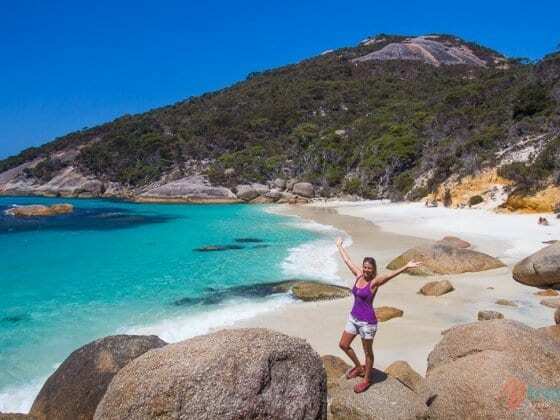 Throw in there the stunning beaches of Rottnest Island, Margaret River, Elephant Rocks in Denmark, and Turquoise Bay and Sandy Bay in Exmouth and WA hits it out of the park! Feeling like this about Lucky Bay and Cape Le Grand reminds me of the time we spent five months traveling through Africa, going on many safaris. Towards the end, we would find ourselves casually saying, “there goes another elephant” without the awe and wonder. It could be just a timing thing. Caz and I said to each other several times, if we’d been travelling Australia clockwise, were near the beginning of our trip and we had just spent three days driving across The Nullarbor (Australia’s longest road), seeing Lucky Bay for the first time probably would have been a WOW moment. 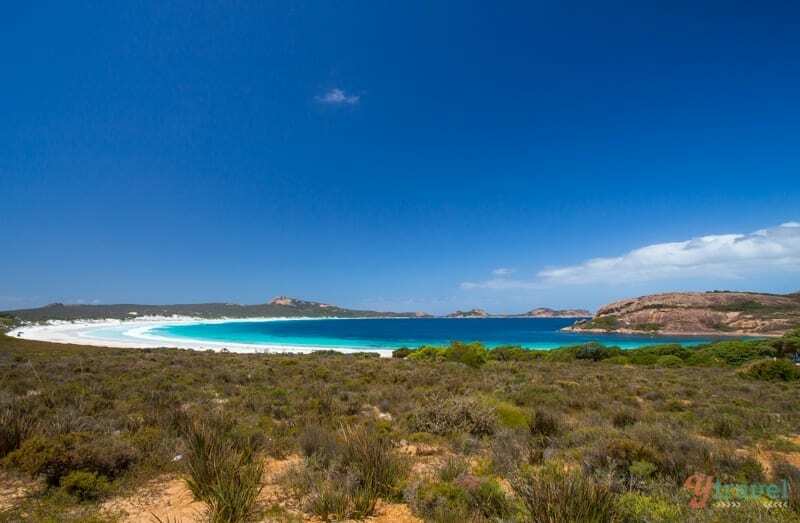 So what does Lucky Bay & Cape Le Grand look like? I know you’re just going to be thinking. “How could you not be blown away by this. You’re friggin crazy? !” Even now as I’ve just finished editing my photos, I’m asking myself if I still feel this way. I mean they are stunning. We did have a fun day. My kids enjoyed playing on the beach, and it was cool to be able to drive our car on the sand (which was compacted like concrete). I could imagine it being as busy as the M1 in peak season. Maybe I was a little disappointed I didn’t get the classic kangaroo shot with the beach background. Or maybe it was the fact that we’d already seen kangaroos on a beach before, and hundreds of kangaroos in the wild. I did get this one shot of a roo up against the bush; even he seemed a little over it, ha ha. I don’t know. I probably sound like I’m fussy, but I can only compare it to what else I’ve seen. 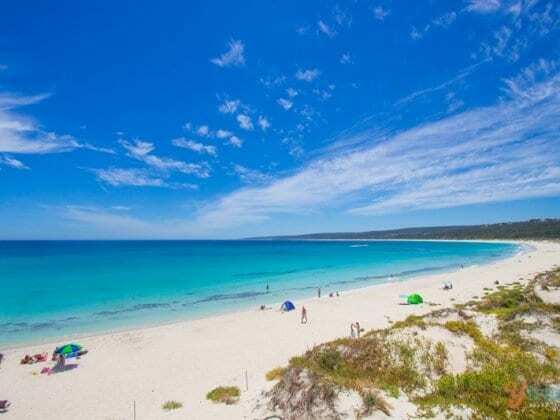 When I think of the “best in Australia” I think about the pure white powdery soft sand you get on Whitehaven and Hyams Beach. I think about the sunsets at Cable Beach, and the surf at Byron Bay. My idea of the perfect beach might differ to yours. For me it’s one that offers more than just sand and water. I can’t sit on a beach all day and just lie in the sun and read a book. I like to have other things nearby. That’s why I love Cable Beach so much. You can spend a few hours on an incredible beach, and at your fingertips are lovely cafes, sunset bars, kids playgrounds and so much more. That’s why I love the Margaret River region. And Rottnest Island. And Byron Bay. And Burleigh Heads. They offer more than just a pretty beach. Again, in Cape Le Grands defense, we didn’t see and do everything in the park. Many people had said how they loved camping within the park and it was a highlight of their visit. To me, at this stage of our journey, rough camping was the last thing I felt like doing. I was struggling enough as it was in our camper trailer in a caravan park. I was even over that. And some of the walks look pretty amazing. We didn’t do any because Savannah is at the stage where she won’t walk and only wants Caz to carry her. Caz’s back and exhaustion refused to entertain it anymore. A short drive west of town are some other stunning beaches, and I’d argue just as good if not better than Lucky Bay, they’re definitely more accessible. And the coastal views from the road are outstanding. My fave was Twilight Beach. If you do end up in Esperance, this drive is well worth it. Knowing what I know now, if I did my 18 months around Australia again, I would skip visiting Esperance for a second time. Now that I’ve seen it once, I’d rather spend that time elsewhere. If I was in Perth, I’d prefer the 20 minute ferry ride back to Rottnest, the three hour drive to Margs, or heading back to Coral Bay. Nothing personal Esperance. And I’m not saying don’t go there, not at all. But some places do it for you and some don’t. We can’t all love everywhere! 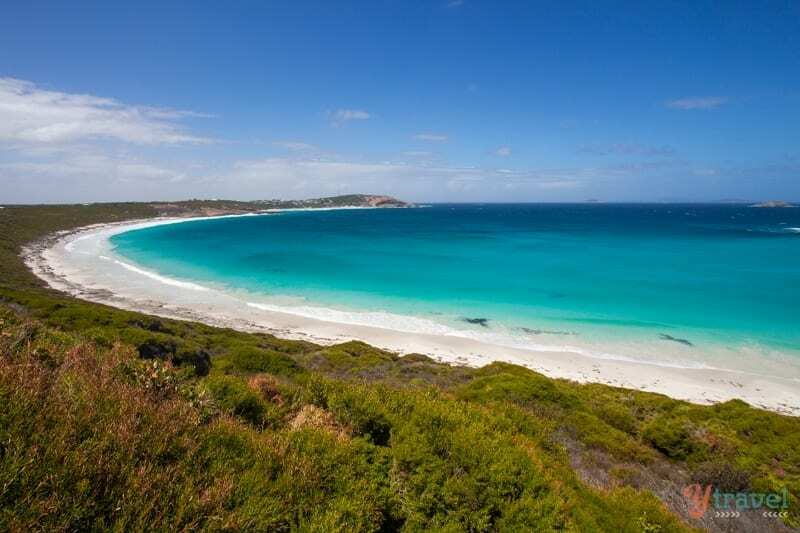 If you like to totally get away from it all, Esperance might be your kind of town. In hindsight I personally didn’t think it was worth the effort, when you have so many other great places in Australia. It definitely depends on the frame of mind you are in as well as what you are comparing it to and if you feel any kind of connection to a place. I personally though Margaret River was overrated, it was nice but not incredible. I also felt the same way about the Great Ocean Road. Yeah, mindset definitely plays a big part and what you are open to. And just to be clear, when I say Margaret River I mean the whole region, not just the town, talking places like Hamelin Bay, Yallingup, Prevelly and River Mouth, Meelup Bay, Eagle Bay, Bunker Bay, Dunsborough, Smiths Beach, Boranup Forest and the caves etc. Not to mention the hundreds of wineries ha ha. 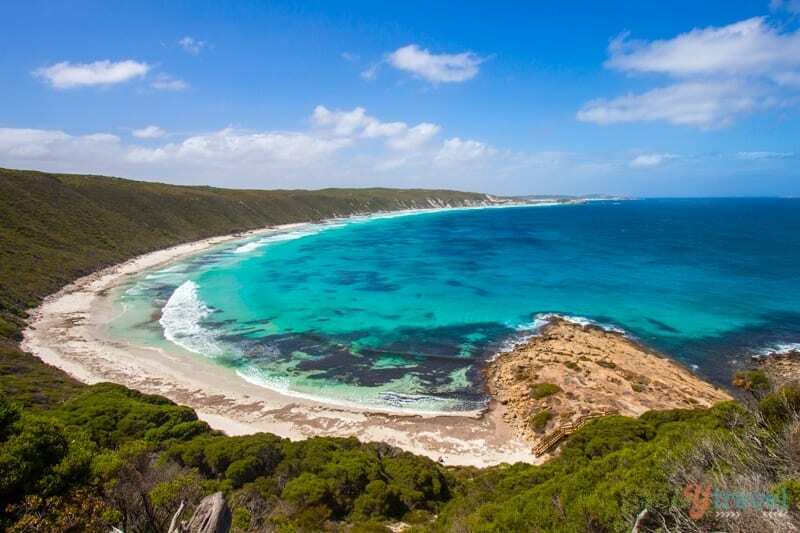 Have yet to visit Kangaroo Island, but looks amazing! Katie, i felt the same about margaret river. Felt to touristy and not relaxing. Everywhere we went was just busy and it wasnt even tourist season. We still enjoyed it but wouldn’t go back. Oh what a shame! I was one of those people who urged you to go see Cape Le Grand National Park. My favourite beach there is Hellfire Bay – it looks from your pics that there was a bit of seaweed in Lucky Bay. Anyway, it definitely depends on your state of mind how you enjoy a place. And yep you can get beach fatigue because they’re all so bloody amazing over in the west! Hope you’re settling in okay at Burleigh. I should have mentioned Hellfire Bay in the post, we did make a short visit there and it was stunning, and I agree with you, probably nicer than Lucky Bay. But I chose to focus more on Lucky Bay for this example. LOVING Burleigh Lisa, it has that perfect mix for us! Interesting! I really think it had to be the timing — I love iconic Lucky Bay! and actually thought that Cable Beach was overrated. Crazy huh 😀 As a surfer, Margaret River beaches definitely take first place in my mind though, and I go down there from Perth justttt about every free weekend that I can. Sometimes places just don’t give you the right vibe and that’s enough to settle it. Definitely has happened to me before. But now that I think about it, I don’t even really remember what the town of Esperance really looks like so that surely has to say something. As a surfer I can see how Margs is the drawcard that it is. Would love to watch the pro event one year! Yeah timing, weather, other factors all play a part. I still think there are better beaches in WA though as mentioned. Either way, you’ve got a great backyard over there!! Great to get your opinion on Esperance. WA is a destination I’m looking forward to exploring in the near future. While I’m there ”time” wont be on my side, so nice to know the places that I can possibly skip. Thanks for sharing your thoughts. Oh Donna please don’t be turned away by one persons opinion. 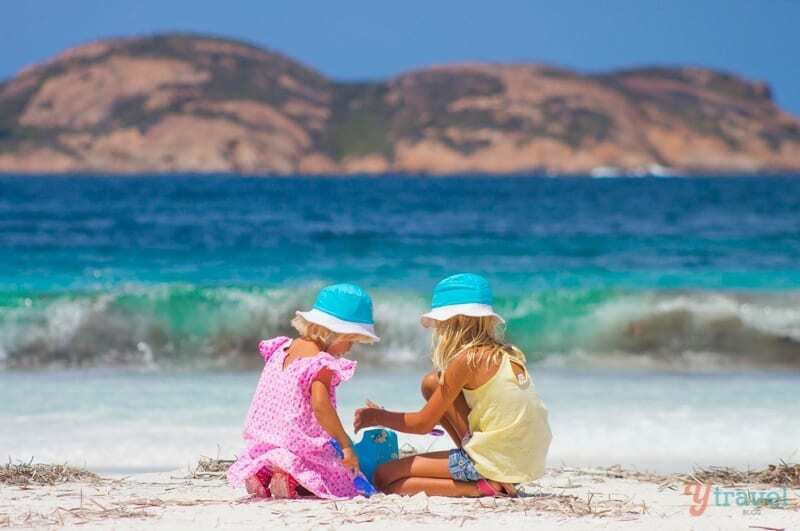 We may not have it all here in Esperance but we do have plenty to offer. This is the first blog i have read where the author has really not been favorable to esperance. So all the hundreds of others that rate esperance very highly must have really been able to see the beauty, sadly this authour didnt and thats ok. But dont just take their word for it. Wonderful! Because we don’t really like being like everyone else. Tracey, I think we clearly stated the reasons we did not like it AND we very clearly said the area is beautiful. Very CLEARLY stated it. Alongside of the photos that we also included to showcase it’s beauty even though we weren’t taken with Esperance. So please, don’t take it personal and just read it properly. It sounds like you visited Esperance at the wrong stage of your trip. I bet had you visited it before some of the other beaches, you would have loved it! It is a magic place, but as you say, your frame of mind makes all the difference. You’ve seen more beaches than most people ever will, which gives you a very different perception. Also, unless your expectations are met in one way or another it’s easy to feel let down. It did have a lot to do with high expectations and having already seen so many beautiful beaches, and maybe we would have had a different perspective if we visited earlier on our trip. I can totally relate to this! After you’ve been to so many beaches you can start to get a little nit-picky! I just use it as motivation to continue searching for that perfect one. When I was backpacking Europe years (and years!) ago, I met an Aussie on the ferry to Greece from Italy. He summed it up with a great quote after I asked him how his trip to Europe had been. (Mind you, he was at the end of a six month journey) “It became ABC mate – Another Bloody Church, Another Bloody Castle”! Love the articles and pics. Don’t worry, there’s always something awesome just around the bend! Yeah, I totally agree with the author of this article. On the other hand, it always depends on your current mood, and on the weather. This beach looks generic to me. Nothing that would blow me away with its natural beauty or anything. You somehow expect more when you travel to the west of Australia. Sometimes, photos of beautiful beaches are simply not enough. Your opinion of Esperance does not surprise me at all, given how long you’d been on the road at the time and the fact you were feeling burnt out, and were also maybe a bit rushed only spending a few days there. However I feel like many of the things you don’t like about Esperance are part of what makes it great for some people, such as the isolation and the town being the opposite of somewhere glitzy and touristic. I wonder if you were to return one day in the distant future, with a 4WD and a week or two to explore off the beat track, if your perception would be completely different. I think it’s good that you share your honest opinions and feelings including some occasional negativity. It means that when you are enthusiastic about something, your readers can trust that it’s genuine, which I think is hugely important once you start earning money off a blog and being endorsed by brands and tourism boards. 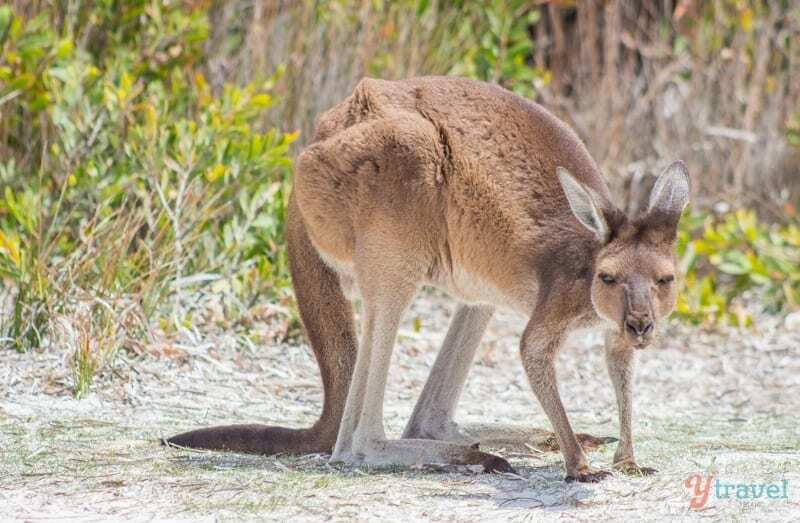 But for this particular post, I hope people read it in the context of your Australia trip as a whole and your mindset at the time, and aren’t too discouraged from visiting the stunningly beautiful Esperance beaches! Bonny: “I wonder if you were to return one day in the distant future, with a 4WD and a week or two to explore off the beat track, if your perception would be completely different”. Me: Kid free? Absolutely. I’m sure it would ha ha. And thanks for GETTING where I was coming from. I thought I was pretty clear on my reasons why I wouldn’t hurry back though. And of course the isolation and the town being the opposite of somewhere glitzy and touristic would appeal to others. Definitely. Each to their own. But I can only write about my experience and expectations and desire. Everyone has to see it for themselves before making judgement on whether it’s a fit for them. I think you’re doing the right thing. You might risk annoying a small minority of people (you can never win there because other people would find it annoying if your lives were too perfect), but it’s one of the things that makes your blog stand out from the crowd and I for one appreciate it, as I’m sure the majority of readers do especially over the longer-term and in the context of the 18-month road trip. Anyone looking for travel inspiration and advice from non-corporate blogs should realise they’re all subjective, and that that’s where their value lies. Thank you for being so awesome and understanding!! Totally agree with you Craig and a great way to articulate it, we felt exactly the same and agree we loved the same beaches around OZ that you pointed out too. The town of Esperance was a huge disappointment, there are many nicer places to visit. Spot on, well done! Thanks Nikki. We have seen some amazing beaches, and towns, over the past 18 months. Esperance was a big disappointment, totally not what I expected, unfortunately. It’s really unfortunate you didn’t enjoy yourself much – these photos make it seem very beautiful! Sometimes people prefer quieter, less to do areas, so I think your review is helpful for people either way. Thanks for sharing! Absolutely Jordan. Travel means different things to different people. We went to Esperance straight from the Nullabor and enjoyed climbing over the rocks at Blue Haven beach and Twilight beach. After being told lucky bay was a 25 min drive from the yha we headed over at 4.30 pm, spent 15 mins there and drove the long way back in the dark! It was pretty but time wasn’t on our side. We are travelling West and I’m now looking forward to the amazing beaches we will pass on our way to Perth after reading this! Oh you’re going to love them Laura! Don’t forget Elephant Rocks at Denmark – it will blow you away. And then all the beaches around Margaret River and Rottnest. We just love them! Yeah I think definitely captured the flaws in your opinions really well. You’re at the end of a long trip visiting a state full of amazing sites, you have two young kids who aren’t suited two of the biggest attractions of Esperance – hiking and 4WDing – you didn’t visit any beaches for surf, you didn’t go fishing, and you limited your coffee experiences to a van selling coffee (albeit fantastic coffee). What on earth did you want from Esperance? What research did you do for the experiences on offer there and the best ways to spend your time? There’s so many obnoxiously obvious reasons why you didn’t enjoy your trip, probably better if you’d just not bothered reviewing the place at all. 0/5 for that purile rubbish mate. There’s a difference Bruno between Esperance the town and Lucky Bay and the National Park, like a 100km difference! I think I was pretty clear on my reasons why I didn’t like Esperance. As a town it just didn’t do anything for me, and that’s coming after experiencing hundreds of towns around Australia. And from personal experience there are many beaches better than Lucky Bay. That’s not being obnoxious, it’s just my comparison from my travels. Do you like every place you visit?? And just becasue I don’t surf, fish or 4wd doesn’t mean I can’t rate a place, and those activities have nothing to do with the town of Esperance, which is the title of this post. By the way our kids do hike and I explained why we didn’t there and I’m sure it would have been a different experience in the National Park if we did. Again, I was pretty clear about that. And I did try coffee at other cafes, they just weren’t worth mentioning. IMO, Esperance the town has nothing on Broome, Coral Bay, Margaret River, Dunsborough, Yallingup, and several other towns in WA. Sorry, I call it as I see it. I can understand the locals getting ticked off; it hurts when an outsider doesn’t love your town as much as you do, but it’s also helpful to get an outsider’s (a paying visitor, same as any other visitor who might actually have the same opinion) honest appraisal because there might be areas that can be worked on which will encourage future travellers. To say there are ‘flaws’ in someone’s opinion is just silly though. It’s just an opinion, it’s neither right nor wrong. 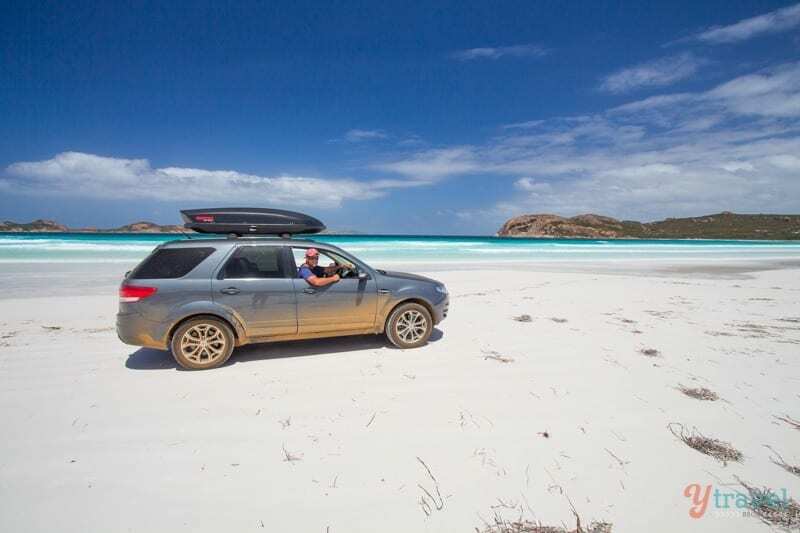 Craig and Caz, it’s too bad you didn’t enjoy the wilds around Esperance as I think it’s a stunning part of my old home state – and I think much of its beauty lies in its remoteness and simplicity. I visited after 3 days driving the Nullarbor, so you could be right suggesting travellers go anticlockwise. I did some of the coastal bushwalks and climbed Frenchman’s Peak and camped in Lucky Bay and loved all of it. I think the beginning of this post was a little harsh; the title and intro implies you don’t actually consider it worth visiting when the post is more about how you probably wouldn’t visit AGAIN. I’m glad you were up front about how ‘over it’ you were, it’s just *unlucky* that Lucky Bay copped it because you weren’t in the mood. Again, all I can say is Esperance and Lucky Bay are two separate destinations. And like I said, I’m judging Esperance against hundreds of other towns I’ve visited around Australia, and to me it’s an average town. Would I return to Esperance again if Lucky Bay and Cape Le Grand weren’t in the area? Not any time soon. Would I enjoy Cape Le Grand National Park if given more time and a better state of mind? I’m sure I would. And I’m sure my opinion of Esperance is not going to kill the town. If locals get upset by my thoughts, so be it. I call it as I see it, and I stand by my experience. i can’t help but take offense when I read this. I actually bristled in defense – Esperance is my town and I love it. If you can’t appreciate it for what it is – we really don’t want you to come back. An assumption I know, but I’m guessing you must be from either Victoria. Hi Stacey, why would you take offense? Why would you take it personally? And why do I have to like every place I visit, do you?? The world would be a boring place if we all liked, did and agreed on the same things! I couldn’t care less about what people thought of my home town, it doesn’t define me as a person! And no, I’m not from Victoria, but NSW. Stacey, we didn’t insult any people. We just said the town wasn’t for us. What I find fascinating about your comment is your outrage at how we’ve offended you personally (and we never said anything about people from Esperance), yet you yourself have written quite an offensive comment about Victorians – that’s millions of people. Really? An honest opinion. I think this experience is more indicative about the difference where we as travelers are looking for when traveling. These travelers do not seem to appreciate the beauty isolation can bring. Who needs a cafe scene when you get that every day in the big smoke? Who needs crowded touristy beaches, I like having lots of personal? Would it worry me that the town is not too exciting? Not a bit I am there to explore the natural beauty not the shops, cafes and restaurant. But you have to respect that not everyone is looking for the same thing. 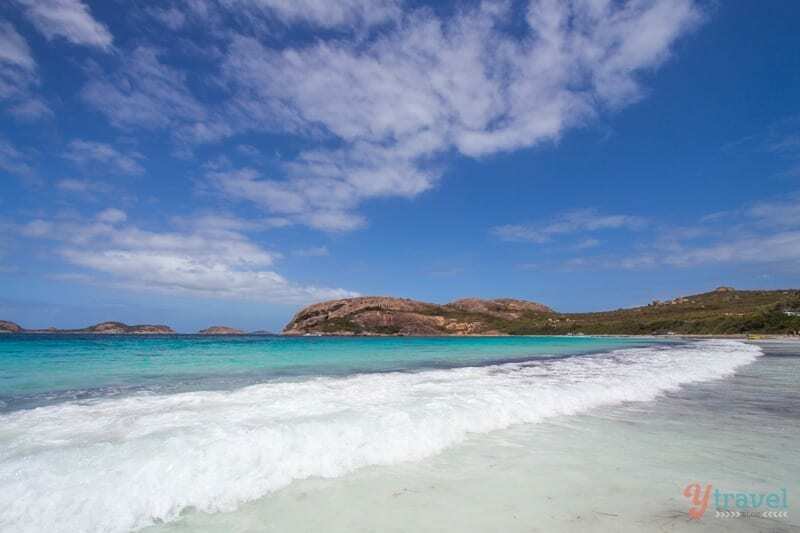 Born in Europe and having traveled extensively, Esperance beaches are still on top of my list for natural beauty. But I admit to being biased as I live in this beautiful town! So pleased to read some good reports about Esperance. I run holiday units. That have 90% occupancy rates. Over the twelve months. In Esperance. And find all our guests only have positives about Esperance. But I do understand we are all different and are looking for different things. Also was great to comment about Hellfire bay. Also my favourite. 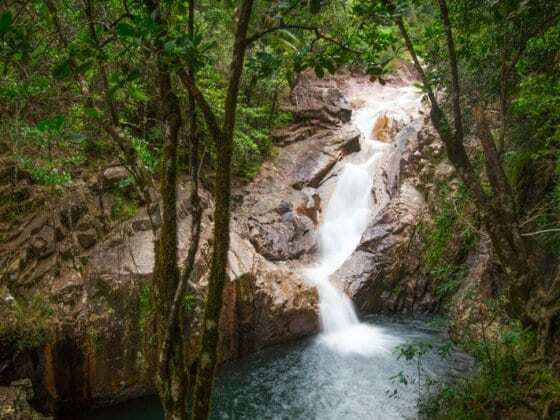 Secluded, sheltered, great swimming, wonderful facilities. Cheers from ESPERANCE. must I have done quite a bit of travelling in my life time and feel ESPERANCE DOES COMPARE AND IN MANY CASES OUTSHINES SOME OF THE OTHER PLACES. I like many others that call esperance home found it after travelling, it just had that homely feeling and i couldn’t keep away.. 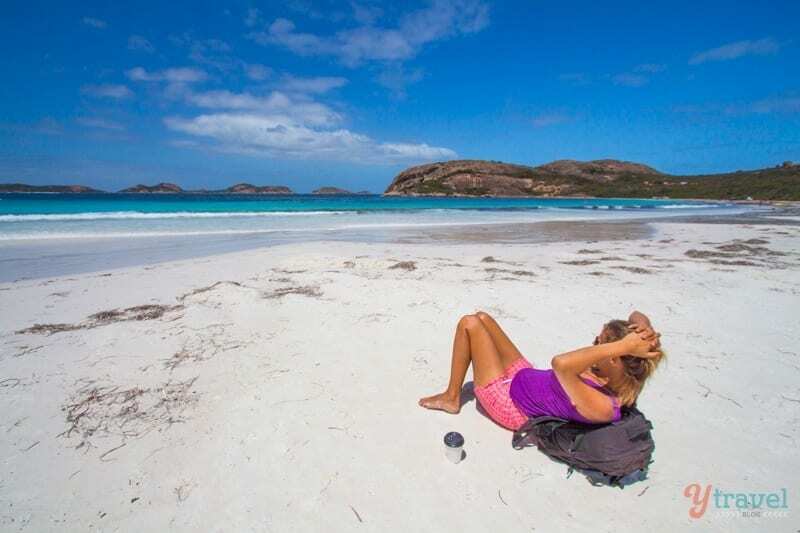 I am constantly meeting tourists and backpackers that have just been in awe of the beauty that esperance has. Many that stay for months to really experience it. Our lifestyle here is second to none. So many places for weekend outings, fishing, 4wding. We certainly dont have it all, but what we do have is pretty amazing and i feel very lucky to choose to live here. Maybe posting on a town when you are in the wrong frame of mind is not a fair interpretation. i felt the same after visitng the ancient ruins of Cyprus.Towards the end i was over it.I must say your photos are really stunning.The water is very blue and the sand is very white.I have been told that Helfire bay is stunning.I ‘ve been told that the water is so blue .Bluer than say beaches at Byron Bay .